What you can’t see coming will disrupt you. What your competitors don’t see coming will disrupt them. All organizations have cultures that promote blind spots, which ultimate leads to failure. Innovation comes from eliminating those blind spots. 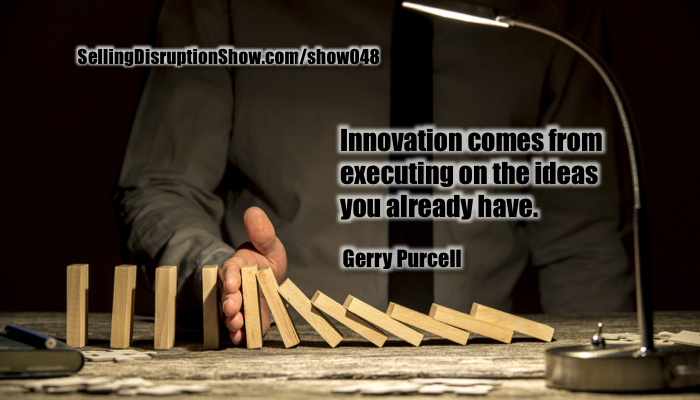 In this idea packed episode, Internal Consulting Group practice leader, Gerry Purcell discusses the five major executive blinds spots to innovation, how to plan for the future, and five ways to deal with rapid change. Discover the insights, tools, and workshopping you need to be a confident, enthusiastic, efficient, and effective executive leader. Next event, Jan 19-20, 2018 in Denver. Mark S A Smith: My guest today is Gerry Purcell, who is formerly with Boston Consulting and A.T. Kearney, now the Toronto Practice Leader of Internal Consulting Group, a global group of consultants that lead with a 21st century approach to consulting and project management services. ICG complements the capacity and capability of its clients, and seamlessly integrates into existing internal consulting and project teams, to deliver the very best combination of internal and external resources in the most effective and agile way. ICG has offices in Toronto, London, Paris, Munich, Brussels, Stockholm, Sydney, Singapore, Melbourne, Auckland, New York City, Copenhagen, and Zurich. As a full disclosure, I am a member of the Internal Consulting Group, practicing in the area of customer acquisition strategy. 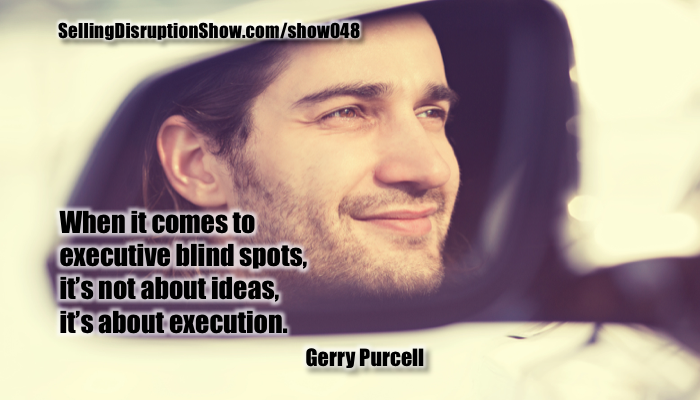 I’ve invited Gerry to the show to talk about the blind spots that executives have, so that we can create disruption by eliminating those executive blind spots. Welcome, Gerry. Gerry Purcell: Thanks for the invitation. Mark S A Smith: You’ve been working with executives for a very long time in a lot of different areas of consulting, to help eliminate those blind spots. All organizations have cultures that promote blind spots, which ultimately leads to failure. All innovation comes from eliminating those blind spots. Our conversation, in the past, led me to that conclusion. What do you see are the big blind spots of executives? Gerry Purcell: It isn’t about ideas. It’s about execution. The execution typically falls into five categories. One is around the labor and the individuals that you have within your domain. Second is the information that you have about your markets, and the research, and the background materials that you collect. The third is how you go about things, the methodologies and approaches. The fourth is the level of professional development and learning, that is part of the culture of your organization. The fifth is the infrastructure around how you operate, where you get your information from, how you do that, a lot of the other sort of less exciting things, but equally as important, in terms of how you accomplish your goals. Mark S A Smith: That makes sense. What you’re telling me is that most companies have great ideas. The innovation actually comes from how they execute on the ideas that they have. Gerry Purcell: Yeah, it’s also how they choose, through this large number of ideas that they have, to focus on the ones that would be the most effective, and then be successful, in terms of making those a reality. Mark S A Smith: A lot of people have blind spots, because they think they’re doing it well. Mark S A Smith: How can we detect those blind spots, or is that something that’s even possible for somebody to do, without a third party coming in, who hasn’t bought into the culture? Gerry Purcell: It certainly would be self-serving to say that you need to have a third party help you through the process, and I think, in some cases, that’s true, particularly in organizations that have been very successful in the past. There may be some resistance to thinking about different ways of doing things, or some concern about the implications that those changes might have on the performance of the organization, fat and happy kind of stuff, where there’s been lots of money made, and there’s some risk that money flow might stop, if we do something to change things. Having said that, there are ways of thinking about the way that organizations operate, be it how they are structured and what kind of capabilities are deployed, to what kind of innovations are taking place and why, to the nature of the way that individual organizations are listening to the markets, and a number of other things like that. There are tools and techniques to look at that, and, often, having a third-party help with that, or drawing upon some of the thinking that’s out there in the broader domain can be really, really powerful, in terms of getting to the bottom of what’s holding an organization back. Mark S A Smith: Indeed, well, of course, you’ve made your living primarily by being that trusted third party, coming in and asking, “Why are you doing it that way?” The hey stupid questions, yet you also work with internal consulting organizations, because a lot of companies have internal consultants that come in and fulfill those roles. Frequently, you partner with those groups. Gerry Purcell: Yeah, and there’s a lot of good reasons why internal strategy and consulting and project management and whatever groups exist inside organizations, because often the outside firms are very expensive, and you have to be strategic, I guess, about where you’re investing your funds, and where it’s appropriate to have an outside entity, and where it’s more appropriate to have an inside one. Having said that, the internal consulting groups still need the same, I call it the love, that they need to have the necessary resources to have access to the leading thinking, to, in effect, think about consulting in the way that the craft has evolved over time. A number of different things that an organization, like Internal Consulting Group can assist, not by darkening the skies with consultants and bringing in hundreds of people, but by strategically, and very directly, assisting in terms of capabilities that don’t exist or need to be developed inside the organization. Mark S A Smith: A good consultant always works themselves out of a job, instead of finding more and more work to do. That doesn’t always happen. A lot of organizations, in the past, have paid enormous sums of money, seven, eight figure, nine figures, to have consultants come in and help them break through. I think what makes a major difference between ICG, Internal Consulting Group, and others is it really is targeted at the mid-market, where you don’t need to have that much money. You can actually get things done for four digits, five digits. Six digits is a big project. We can now bring some extraordinary management strategies and tools to companies, who need to accelerate, but just, in the past, couldn’t. How did ICG move into this particular market space? How’d this get started? Gerry Purcell: Well, the market itself is changing, and we like to think of ourselves as part of that disruption. Having said that, the availability of talent and what has come to be called liquid labor has dramatically changed the way that things operate. The traditional ways of engaging a third party, or even in running your business, as a business owner or leader, have changed quite a bit. ICG connects the supply of labor, of this liquid labor that is made up of many, many more independents than it used to be in the past, and smaller boutique type firms, and connects them with the demand. In a context of medium-size to low-end large-size organization, they don’t often have access to that kind of resource, particularly from the tier one firms. What ICG does, as well, is to bring to bear talent that, perhaps, spent some time in these larger firms in the past, and now has 15, 20, 30 years of experience in the business and can be brought to bear to help organizations to think through issues, but not with the traditional pyramid approach, and not really at the price point that the larger firms would charge, because they have a lot more infrastructure that has to be brought to bear to assist. It’s just a much simpler way of engaging. It brings to bear much more experienced individuals, much more targeted assistance. It provides access to services that would not have been available in the past to midsize organizations. Mark S A Smith: In the world of ICG, the folks I have been exposed to that have become part of the organization blow my mind. For example, Chris Stark, who we’ve had on the show twice … His show on lean organization is, by far, the number one show. It’s just extraordinary, the talent that ICG has attracted, Gerry. How have you been able to round up these extraordinary people? Gerry Purcell: It’s a little bit of luck, I guess. 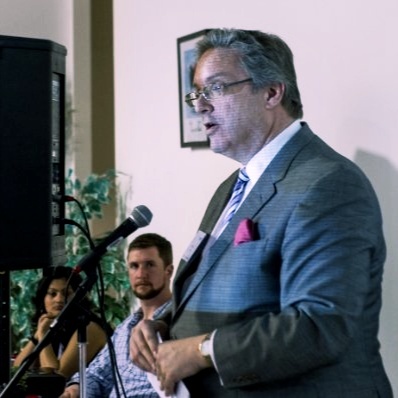 Also, we provide a collective environment, where individual practitioners can have trusted relationships within the marketplace, and, for those who are thought leaders, often based on years of experience and research, we also provide a mechanism to distribute their intellectual capital, which they would have to build themselves. The Norton and Kaplans of the world, that developed the Balanced Scorecard, have had to build their own infrastructure. What ICG does is provides that infrastructure, but also provides a community of professionals that can provide support and the sort of business social aspects of being a consultant, because being an independent consultant or a small boutique can be kind of isolating. What it also does is provides a similar kind of community of interest that you would have in a large firm, where ideas can be shared, IP can be developed as a group, teams of consultants can focus on core industry issues together; whereas, an independent organization or a small boutique might not be able to do that or have the geographic reach to be able to have conversations with clients, broadly, about these issues. Mark S A Smith: What we’re really talking about is two components of ICG listener. One is, as an executive, do you need some help with your blind spots, if you’re not performing as well as you think you might, or you’d like to just stay ahead of disruption and like to do disruption? Or, if you happen to be somebody with skills and you have a solo practice, perhaps this is a way for you to expand your reach and join a professional organization that does this in a vetted and meaningful way. Gerry, I like the place where you took that particular conversation. Let’s get back to the concept of liquid labor. In my new book, I talk a lot about how we are moving to the world of subscriptions, where a lot of organizations are not buying. They’re renting or leasing. That includes talent. That includes liquid labor. Share with me some of your insights in how this pivot has gone from this concept of owning employees to renting employees, and you’re calling it liquid labor. Gerry Purcell: Yeah, in the old days, probably not that long ago, labor pools inside organizations, big and small, were made up of a couple of different kinds of labor: full-time staff, part-time staff, perhaps some contingent labor, but mostly contract people or small engagements with outside consultants, that kind of stuff. It was relatively easy, and the mix between people who were yours, so to speak, your staff, and outside, was skewed toward yours, and the process was quite simple. The marketplace has changed quite a bit in that regard, over the last, say, 15 or 20 years. There’s a move towards a much more fluid mix of employees and professionals, where organizations don’t hold the capacity that they used to, to be able to deal with non-business as usual issues. On a day-to-day, there’s less of a mix of those in a sort of domain, but, over time, we’ve learned how to bringing in many more independents or contingent laborers, to help do business strategies, crises that take place. I mean, you bring in a bunch of people around a privacy issue, whatever the thing is. That makes the way that an organization has to manage itself way more complex. What we offer, certainly, is the contingent labor to be able to fill those gaps, but what we also do is help organizations to think about their liquid labor. Broadly, the labor pool is made up of four different quadrants. It’s about whether the task that’s being completed is complex or transactional. Then, the other dimension is whether the work that’s being done is proprietary or not. It really defines whether you bring in outside labor to help you to do the work that you need to do, through a service provider, or whether you look to bringing in a consultant to assist with a more complex issue, or whether you maintain a pool of labor that you employ, that deals with things that are both strategically yours, and so, therefore, you don’t want third parties involved with it, competitors or providers, or you can focus attention, from an efficiency perspective, on automating those within your internal workforce. Those mixes are a much more complex way of thinking about labor. What we try to do is to help organizations make their way through that challenge and set up an appropriate mix and a process of managing those resources. On the other side, I think, individuals are much more inclined to have multiple careers through their broader work life. Individuals are often in and out of roles. We call it the gig economy. What’s happening on the demand side is that it’s getting much more complex for companies, and on the supply side, there’s a lot more interest through the labor force in all the different domains. The millennials and the categories of labor are all moving towards much more of this gig economy, this independent, multiple career path type arrangement. The third thing I think is important is, because of the flattening of the supply, there aren’t entities that really represent the interests of the broader labor pool, both from the point of view of accreditation, but also from the point of view of protection, because it used to be that everyone worked for the company, and the company had a certain fiduciary responsibility for the individual employee staying whole financially and giving the right kind of advice around their lives. Now, when there’s so much contingent labor that actually doesn’t exist, in many ways, for that contingent part of the labor pool. Partly, what ICG is about is helping to provide the underlying accreditation and the signal to the market of quality, but also providing an environment where, over time, there could be some representation of the employees. What we think is, that over time, the old guilds, that were built around the Industrial Revolution, will re-emerge, because there will be a whole bunch of independent employees and companies that are deploying them, but nobody, really, who acts on behalf of the pool of employees. Mark S A Smith: I think that’s a really important point, this idea that contingent labor’s no longer protected. They’re not accredited. I agree with you. I think we’re moving more and more back to a series of tribes–and I mean that in the most loving sense–of people, guilds. I like the word guild here. We’re looking after each other, and we’re also making sure that we hold each other to a certain level of standard. There’s room for people to head those guilds and to launch those guilds and to reconnect with those guilds. I like it. I also think it’s important, listener, for you to understand the conversation that Gerry went through about the concept of complex versus transactional and proprietary or not. That model can allow an executive to very rapidly decide who is most suitable and where there’s opportunity to outsource safely or outsource to enhance. Gerry Purcell: Mm-hmm (affirmative), yep. Mark S A Smith: I think it’s really important to have conversations around that, and in the short duration of this selling disruption show, we really can’t go terribly deep. Executive, if this resonates with you, I’d highly recommend that you connect with Gerry and have a conversation. Let’s talk for a moment about researching about markets. What do you see as blind spots where companies do research about what they do next? Gerry Purcell: We think about it in a context of just broader innovation. One of the areas that I would call a blind spot in innovation is the horizons, within which innovation is being considered. What I mean by that is there basically are three. There’s the near term, there’s the medium term, and then the long term. A lot of companies understand that they need to be thinking about the longer term, but many, many, many, 99% really focus on the short term. 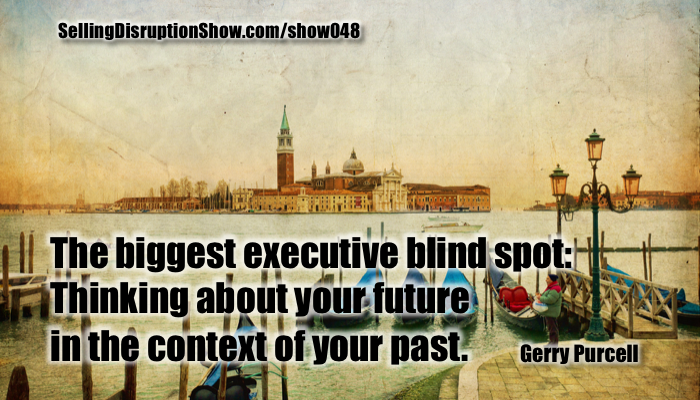 A blind spot is to be thinking about your future in the context of the past. Mark S A Smith: That’s really good! You’re right! Gerry Purcell: I think, if you were to go the other way around and focus 99% on the longer term, that would also be a problem. What is currently the case is that something in the order of 99%, say, are focused on that first horizon, which is the current state. If they were able to spend some more time thinking–maybe it’s 85% versus 15 or something–about the future, that would be much more appropriate. Other things around innovation is it’s the new buzzword, but we’ve been talking about innovation for, well, longer than I’ve been around, probably. It had different titles, different nomenclature. We are very married to the way things are today, and many of the decisions we make are clouded by that understanding. That historic view doesn’t necessarily hold true, in terms of the conclusions you’re going to get, when you actually have to think forward. There’s a paradigm of the Swiss watchmakers, who held onto the concept of the way watches were made, and then the watchmaking industry bypassed them. Mark S A Smith: You’re absolutely right. Another example I like to use, Gerry, is the Merck Manual, used in the world of medicine. The Merck Manual defines a state of care for how you handle specific diseases. If you used a hundred-year-old Merck Manual, which was, at that time, state of care, and if you’d use those same treatments today, you’d go to jail for malpractice. Methodology is a moving target. I guarantee you, if I brought you a doctor, who sat in front of this microphone, from a hundred years ago, he’s going to say, “You must use mercury to take care of syphilis.” If you’d do that today, you’d go to jail. Gerry Purcell: That’s an important way of thinking about things, because there’s lots of examples of where people, organizations of all stripes, have been very engaged and embedded in an old way of thinking. Innovation requires that we think about things outside the box a bit, not crazy, take the company out of business stuff, but thinking about where the market is going. We talked about liquid labor as an example. I think there are dramatic differences in the way that large organizations and small will operate, given the labor pool and given the way the market is, that are driven by all sorts of things other than labor. Cybersecurity, some of the crises, some of the economic changes in the marketplace are all driving changes in businesses, which drive changes in organizations. We have to make sure that we get our arms around what’s coming and make the appropriate adjustments to our model, or at least think about things in a longer-term context. Mark S A Smith: Yes, and one of the things that you shared with me in some of our past conversations is this notion of those horizons as being market chasers, need seekers, and technology innovators. Gerry Purcell: We have a way of thinking about innovation that draws upon the thought leadership of a number of different academics across the world, and packages it up into a broader framework. One of those frameworks is around innovation and types of innovation. The three that you talked about are the need seekers, the market readers, and the technology drivers. Innovation is about improving your competitive position, so it’s really about understanding your market, but there’s different ways of approaching it. The need seeker is really looking at opportunities by understanding what the end users want. The market reader is finding opportunities that already exist and capitalizing on those. The third one is probably more around horizon two and three than the others, which is driving for a breakthrough, rather than incremental changes, based on technology. What we find is that neither one of those three is the answer for everybody. It’s really about understanding what your market is and what’s the most appropriate. We try to figure out what the correlation is between what the broader organizational strategy is and what’s the appropriate style of innovation that would be applied to that. We have a significant amount of data–I think 6000-plus companies–where we can understand how the company that we’re looking at compares to their peers in industry, their peers geographically, their peers from a whole bunch of different dimensions, in terms of how they look at the need focus, what kind of innovations should be taking priority, whether they should be focusing on reestablishing their vision. Is it about production? Is it about the execution of the changes? All those sorts of things that are really part of the innovation process. Mark S A Smith: There’s so many different factors to keep in mind. As you point out, it’s very dependent upon the company, and their ability to innovate. Without innovation, you will be disrupted. It’s just a matter of time. It’s a balance of the three. If we take a look at the world from a hedge fund approach, with hedge fund meaning when one asset comes down, another asset goes up, and it balances out the risk in the portfolio, we can do the same thing when it comes to a product or service portfolio within an organization. The need seeker is going to give us some very rapid returns, if we can deliver a better, more innovative thing to the initial needs, what customers want right now, but we know customers are fickle. They are a moving target. What they love today, they will hate tomorrow. If you’re just getting into the world of fidget spinners, it’s probably too late for you. You’ve missed that one. Yet, tech innovation also takes time. It takes a long time to put those things together. Working that blend between these three create a sustainable disruptive organization. Thoughts? Gerry Purcell: Yes, and I think the pendulum can swing both ways inside an organization. It can swing to all sorts of cool, new ideas that could be disruptive of the marketplace and whatever, but lose connection with the actual business, the ongoing business-as-usual business that is paying all the bills. On the other side, it can be very incrementally focused, and focused on the business-as-usual business, without thinking about the future or dramatic transformational changes in the marketplace. Where it meets is in what we would talk about as the prioritization mechanism around ideation, so that when individual organizations are thinking about change, how do they decide which ones they’re going to do? How do they make sure that there’s a connection with the longer-term strategy of the organization, that they’re picking the right ones? Because also, with that pendulum swing, there can be a focus on trying to do too many things at once, and that means that nothing gets done properly. It’s not really about they’re being good ideas, because, I mean, there’s all sorts of good ideas. It’s really not just about that. It’s about what do you do with them when you have them? How do you decide which ones are the most likely to have an impact on your organization? Which ones are going to have a return that’s positive? There are organizations that are really good at generating ideas, but very poor at selecting the ones they should pursue. Mark S A Smith: Also, ones that are really good at pursuing ideas to the ground. They tie their horse to a particular wagon, and that wagon just flies apart. Probably too old of a metaphor, isn’t it? Gerry Purcell: People understand. The thing that I find very cool, in the context of innovation, connects back to the structure and the individual people that are part of the organization, as well. We call them personas. One of the things that’s really interesting, when you look at an organization, is what is the mix of types of people, and the characteristics within which they operate, that an organization has? Is there the appropriate mix? Do you have enough of what is required? An example is around risk. Gerry Purcell: We have a persona we call a hurdler. A hurdler is somebody who is a tireless problem solver, who looks to overcome stuff, whatever the cost is. An organization that’s going through change has to have some amount of those types of people or nothing is going to change. At the same token, they can’t have 100% of them, because there would be chaos. Some elements of the right kinds of people, and the right mix, that one has to consider, and part of that is understanding what kind of change you’re trying to make, but also are you a risk averse organization? Do you have the right kind of mix, that kind of stuff? I just find that fascinating. It’s not something that organizations think about typically, but it’s a really important thing, as important as capability is around Chris’s work, which is defining the strategy of the organization, and what are the appropriate capabilities at each of the levels that need to be deployed, in order to get to the end goal. Mark S A Smith: Indeed, well, I think it’s important to talk about this concept of risk aversion. That is absolutely cultural within an organization. It’s substantiated by the top and trickles all the way down. The challenge that we face in changing cultures with this is we’re essentially changing the rules of the game, while the game is being played. For a lot of people, that’s a really hard thing to imagine. We have to disrupt ourselves, if we’re going to disrupt the market. That’s hard on a lot of people. What’s been your experience in working with organizations, when we do this kind of rule change in the middle of the game? Gerry Purcell: What comes to mind is a way that I think about change and the key principles that are necessary for change to get embedded in an organization. If you look at it from a leadership perspective, there are really five things. The first one is that it’s about the leader. You have to set the right environment. You have to create an environment that has the potential to change, and that you provide the necessary resources for the organization to accomplish what has to happen, because you play a big role in the change. If you’re not going to change, then how can you expect the organization to do that? Mark S A Smith: People today can detect if you are not walking the talk. Gerry Purcell: Yes, the other one borrows from a famous phrase that says, “Don’t let the culture eat your strategy.” That’s the other side of things. There is always going to be resistance. The question is, how do you communicate your aspirational changes that you want to make, and make sure that it addresses the tribe, as you describe it, and that it lands with them, around what you’re trying to accomplish, and what the implications are for them, and why it’s good in your organization, and managing that change in culture, in effect, so that you can meet your strategic objectives? The other thing is to be transparent. Making change is really difficult, but you have to be really open and clear about where you’re trying to go. People have to understand how they fit. How is it going to work? How does it affect me? What criteria are you using for success? How can I get an opportunity to just be part of that change, as a player in your organization? Gerry Purcell: Do it! Be it. If you think about it in that context, it actually drives you to do things you wouldn’t have done. The last one is enabling people, in terms of the current cultural environment, providing those who might be constrained by financial resources or capability or whatever it is to basically play a role in the change. That’s a really critical part of the change process, as well. To me, those are the five things that I, in the past, recommended to clients of mine, that they really had to think about, in terms of a change [crosstalk 00:25:56] from a leadership perspective. Mark S A Smith: I think that’s a really great surprise, five ways of dealing with change that I didn’t expect for us to bring up. Gerry, it’s really great stuff. The point I want to really make here, this last point that you made, which is enabling people, in terms of current culture … In my experience, and I think this maps to yours, as well, anytime there’s radical transformation, radical disruption, in an organization, a third of the folks just aren’t going to make it. They’re just incapable of making it. They need to retire. They need to be placed in other roles. What we have to do, as leaders working people through change, is to isolate that third that can’t make it, as quickly as possible, relocating, whatever we have to do. I think that’s really an important to call out. Then we can recruit that other middle third being led by the third that just can’t wait to go that direction. Your thoughts? Mark S A Smith: Listener, just let us know if you’d like to have that hour conversation with Gerry. We’ll break it into a two-part show. We’re going to do a little need seeker here, okay? Mark S A Smith: Right, blacksmiths, buggy whips. Gerry Purcell: And those individuals, who didn’t buy into the change, there’s research that says that, for several generations afterwards, it had an economic impact on those families. For those who bought into the change, or who were able to be brought into the tent and, through the principles I was just talking about, they actually did very well, and they became the people … Rather than making saddles, they made the car seats or whatever it was. Mark S A Smith: That’s what it was, the coachworks. Actually, those that made carriages turned into coachworks for automobiles. Gerry Purcell: In fact, much more successful than they were as saddle makers. It’s understanding that, and I think the challenge and the problem we have in some of today’s environment, when we’re making changes, we don’t think about those 30%, and we really should. We should have a plan for it. If someone’s going to make multi-billion dollars on a new industry, they need to think about what they’re going to do with the 30% that aren’t going to survive. Mark S A Smith: You’ve got to look after them, because they can kill the organization if you don’t take care of them, if you don’t have a plan for them. A great point for us to wrap up this episode, this Selling Disruption show. Gerry, how can our listener get ahold of you? Gerry Purcell: The best way is email, I think; gerry.purcell@internalconsulting.com. Gerry Purcell: Also, to offer any of the listeners an opportunity to sign up for our Insights Review publication, which provides a synthesis of broader industry changes coming on globally every month. It’s very valued by our network, and I think you’d find it quite interesting, as well. Gerry Purcell: Send me an email, and I’ll get you set up. Mark S A Smith: Listener, I highly recommend that you sign up for that Insights. It is world class, executive level synopsis of the trends and insights you need to know. Just getting that document alone is going to help you manage to eliminate the blind spots that are going to creep up on you. Gerry, this conversation has been absolutely a delight. Thank you for joining me and sharing your insights with our listener. Gerry Purcell: Thank you for the invitation.